Intimate friendships between single women are often the primary relationships in their lives, and in fact there is a historic precedent for these bonds being as strong as a romantic partnership. But what happens when the single ladies start pairing off? 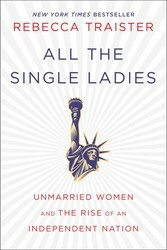 I interviewed novelist Elliot Holt about how her friendships have changed over the years in All The Single Ladies. Elliott recently spoke to an ex-boyfriend who told her that she needed to make friends who were in their twenties or their seventies. And she’s tried. On a work visit to New York she met a group of young women who invited her out with them. She had a nice time, until, she recalled, “at eleven-thirty, they said they were going to head somewhere else and I had the sense that the night was just starting, and was going to end at two in the morning.” Elliott felt the decade and a half that separated them keenly. “I was born when Nixon was president,” she said. “And they’d go out and take smoke breaks and I thought, ‘Oh my god, you guys smoke! My friends all quit at twenty-nine!’ I had a drink and a half, but I was tired and out of sorts.” Elliott went home.